✴An inscription (CIL X 4876, at pp. 59-60, entry 57) from Venafrum commemorated Caius Aquitius Gallus, a military man who had served in a number of posts there, including as praefectus iure dicundo on two, probably consecutive, occasions. 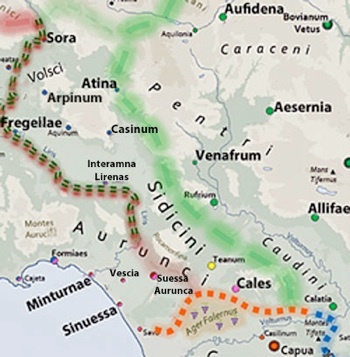 Spadoni noted that Venatrum was colonised in the triumviral period and that the cursus of Aquitius suggested that he had been one of the first pair of duoviri iure dicundo of the new colony and that he had held this post simultaneously with that of praefectus iure dicundo. In other words, in this two-year period, he would have administered the affairs of the new colonists and also the established citizen settlers in the erstwhile prefecture. ✴A funerary inscription (CIL IX 2346, at p. 68, entry 69) from Alifae, which Spadoni dated to the 1st century AD, commemorated Caius Aquillius Rufus, who held the post of praefectus iure dicundo. Epigraphic evidence suggests that Allifae was a colony by the late 1st century AD, although the date of colonisation is unknown. Aquillius had held the posts of aedile and duovir of the colony before his prefecture, and Spadoni suggested that this was a one-off post, established because of a vacancy in the duovirate. In other words (if I have understood her correctly, after colonisation, one of the serving duoviri would normally have taken on the functions of the erstwhile prefect. ✴A Latin inscription (CIL IX 2802) from Aufidena that apparently pre-dates the 1st century BC records the building of a bridge by two prefects. However, Maria Carla Spdoni (referenced below, at p. 72, entry 75/6) suggested that the prefects in question held only a temporary commission in respect of this construction project. If this is correct, then Aufidena can be safely omitted from this discussion. “Plancius comes from the prefecture of Atina” (‘Pro Plancia’ 19). “There was not one citizen of Arpinum who was not anxious for Plancius, not one citizen of Sora, or of Casinum, or of Aquinum. The whole of that most celebrated district, the territory of Venafrum, and Allifae, in short, the whole of that rugged mountainous faithful simple district, a district cherishing its own native citizens, thought that it was honoured itself in his honour, that its own consequence was increased by his dignity. And from those same municipia, Roman knights are now present here... ” (‘Pro Plancia’ 22, my bold italics). •Atina had not been municipalised by this time, so Cicero described it as a prefecture. When Atina was subsequently municipalised, it still remained a prefecture: an inscription (AE 1993, 0565) from Aesernia that probably dates to the 1st half of the 2nd century AD commemorates a now-anonymous patron of a number of places, one of which was the municipium and prefecture of the Atinates (see Edward Bispham, referenced below, at p. 97 and note 116). Thus it served as the seat of a Roman prefect who presumably administered justice to the citizens in the surrounding area. •Two inscriptions (CIL X 5193 and 5194, at pp. 16, entry 7), which she dated to the 1st century BC, commemorated Caius Futius, praefectus Casinatium. •The third (CIL X 5203) commemorated a Numerius Savonius, who was designated as pr(aefecto). She suggested that both men had been appointed locally and held their respective offices in the period in which Casinum was a municipium (i.e. in ca. 90-40 BC, before a probable colonisation in the triumviral period). It is possible that these ‘municipal’ prefects replaced Roman prefects who had operated from Casinum in the prior period. It was arranged that the tribunes of the plebs should get a plebiscite passed requiring P. Sempronius, the praetor, to appoint commissioners for the founding of colonies in those spots. But it was not easy to find people to be sent to what was practically a permanent outpost in a dangerously hostile country: [potential colonists preferred to have] fields allotted to them for cultivation”, (‘History of Rome’, 10: 21: 7-10). Thus the newly-enfranchised residence of these centres would have been placed in the tribe of their citizen neighbours. “Allifae and Venafrum were urbanised centres before the conquest, [as evidenced by the fact that] they issued a coinage ... [described (in note 171) as: silver (Allifae, 4th century BC) and bronze (Venafrum, at the start of the 3rd century BC)]. After incorporation, the Romans surely left in place, [albeit] in the form of municipia, the [administrative machinery] of these communities, whose prior autonomy was indisputable. This autonomy was restricted [after the conquest] only by the judicial competence of the praefectus i.d. and by the demands of Roman sovereignty” (my translation). In other words, in Humbert’s opinion, Allifae and Venafrum were both substantial, self-governing centres before the conquest, and they were probably constituted simultaneously and immediately thereafter as both municipia and prefectures. “The date of municipalisation is most uncertain, but [citing Humbert, above] it may have occurred at Allifae and Venafrum before the Social War. ✴Edward Bispham ended his note with the words ‘non liquet’, indicating that the situation is unclear’. It is probably safest to take the default position that none of these prefectures was constituted as a municipium before the Social War. Furthermore, in the absence of archeological evidence, it would be rash to assume (as Humbert did on the basis of numismatic evidence) that any of them was substantially urbanised.